I like SFF computers. But for unRAID you need something a little bit bigger. So I'm in the process of making a 10 drive mini-server. That's about as big as I could ever need. And while there are interesting things going on with mini-ITX I decided to stick with microATX. I modded the case because there really isn't anything small like I want. And it took awhile to find parts that would fit in a 15" x 14" case. I printed out full scale images of some multi-drive bays and even a motherboard to do some pre-purchase measurements. So far either the Icy Dock or Chenbro 5-in-3 hot swap bays will fit. The motherboard has 6 sata ports and those 6 ports won't be hot swap. But I'll be adding two PCIe cards with 2 hotswappable sata ports on each so a total of 4 hotswap ports. Also, those hotswapable ports also support eSata if needed by just using an adapter cable. Curious, is that the Rosewill R101 case? How did you mount the 5-in-3 docks on the bottom? Looks like the Biostar A760G M2+, good choice. Smaller than most microATX mobos, but still full-featured. I'm also curious as to how you will mount the lower 5-in-3. I imagine some modding is in order? It is the Biostar A760G M2+ which I credit to you for finding Rajahal. Thanks for that. I had to make a new metal bracket for the lower right side. I can't rivet it into place until I have an actual 5-in-3 unit because it takes 6 or 7 rivets and I want to make certain the bends are completely acurate. 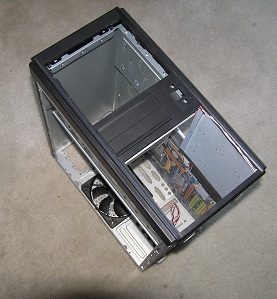 Curious, is that the Rosewill R101 case? so what case is it? I showed it to a friend who now wants to buy one of these cases. Any excuse to buy some more tools sounds good to me! I'm not sure if anyone on the forum would be interested as I'm guessing most of you are pretty handy yourselves. It's not as pretty as some but it's got a certain "I mean business" look to it. For anyone who wouldn't need all 10 hard drives just put in a 3-in-2 in the top and a Blue-Ray player or something. Still room for two 3.5 external devices. $139 + shipping for a bare case no psu. The cover is roughed in. So what is the case model?? (before the operation). You're the third to ask that and I don't want you to think I'm ignoring you. Maybe we should have a prize if someone figures it out. I believe it is the Rosewill R-102-P-BK. From the side they match up perfectly. 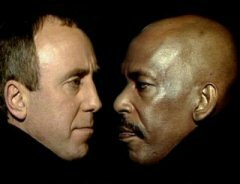 What makes it confusing is that queeg moved the power/reset buttons from their normal spot into the spot were the case's frontside USB and audio ports normally sit. That's why the topmost pictures on this thread look different from the rest. However, if you look at the skeleton pictures, you'll see the cutouts in that area are actually intended for the USB/audio ports. queeg also must have removed the pieces of plastic separating the three upper 5.25" drive bays. 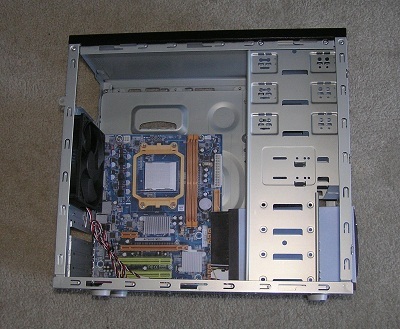 I did some research to find motherboards that would fit this case and allow the 5-in-3 bays enough room. These are separated into two main groups. They are all microATX of course. Doing a quick once over I believe their chipsets are supported but don't take this as a promise. Do your own checking. 1. Size: narrow microATX boards. Generally, anything 9.6 x 8.0 or narrower will work. 9.6 x 8.3 should work. 9.6 x 8.6 may work - check for any parts that might stick up near the right edge of the board. There are a variety of differences. 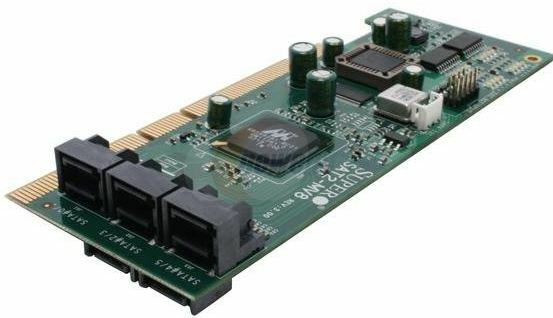 Some have 4, 5 or 6 sata ports. Some have eSata ports which could be used as hot swap sata ports if desired. Some have 2 PCIe16 slots, some 1 PCIe16 and 1 PCIe1 etc. Some are HTPC boards with HDMI connectors. Some have 4 ram slots. Different prices and manufacturers. I'm sorry to say I completely ignored Gigabyte boards due to the HPA issue, damn Gigabyte get rid of this lousy feature. I only researched on Newegg because they make it easy. 2 sata, PCIe16, PCIe1, 1 ram slot, really small/cheap, would require sata add on card(s). cool boards that are certainly too big. Would the http://www.newegg.com/Product/Product.aspx?Item=N82E16815121009&Tpk=aoc-sat2 work? 8 ports right off the bat in one slot. 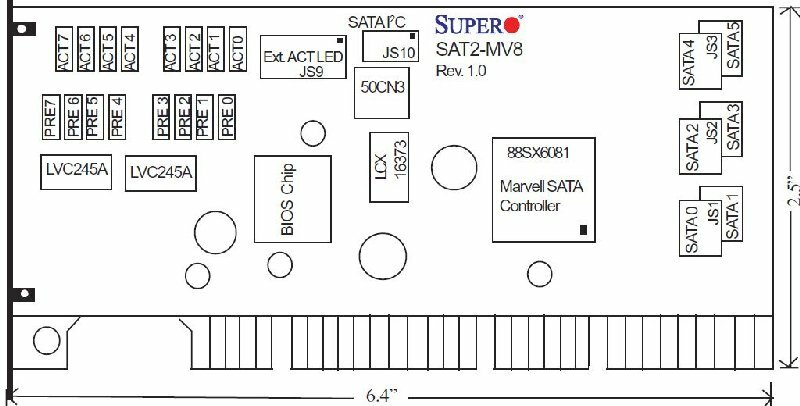 I'd say yes because it's on the hardware compatibility list and it's less than 7 inches long so it won't interfere with the 5-in-3 bays. 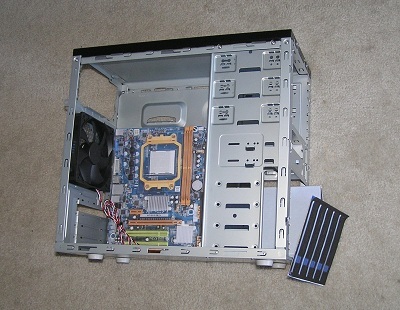 In the attached picture where the fan sticks out (above) the motherboard about 3/4 inch. The mocked up motherboard is 7.8" wide. The mocked up bay device is the Chenbro 5-in-3 with 8.8" total length including fan. Icy Dock 5-in-3 is 8.6" long including fan. Needless to say, Mini-ITX boards will also fit, albeit you'll be limited expansion-wise. They're also pricier than mATX offerings in general. I have a few Biostar G41-M7 (9.3" x 7") motherboards that I think I might use for a similar project. No Gigabit but that's okay since I have some spare Intel Pro/1000 GT NIC's. At the moment I'm not interested in mini-ITX for that same reason, they are much more expensive. They might fit but it would require moding the microATX mounting plate. I'd rather have the wealth of choices that microATX has to offer. I added a second criteria to the page because all those boards I listed have Gigabit ethernet. Thanks for reminding me. If you already have the G41-M7 boards then ok but there are better choices for the same money. They only support Fast ethernet and have only 3 expansion slots of which only one is PCIe. Pretty certain you don't have to do any modding. The mounting holes in Mini-ITX boards line up with microATX. Albeit, the price and lack of expansion is a major deterrent. The G41 M7, I got as part of CPU/MB combo from Fry's. They had the Intel Celeron E3300+Biostar G41-M7 for $38 ($28 after MIR) - cheaper than buying the processor alone from Newegg so now I've got a couple of MB's I have no use for and some old procs (Celeron 430, Pentium DC E2160) that can be paired with it. I didn't know mini-ITX holes were supposed to line up with microATX holes. Interesting, and thanks for sharing that. At that price I would have bought them as well. The E3300 is a nice processor. I got around to ordering an Icy Dock 5-in-3 today. I was having the hardest time deciding between it an the Chenbro. They both have such distinct looks and I like each one. I'll be able to tell just how they fit into the bottom bay and then I can attach the bottom right mounting bracket with rivets. I'm still up in the air about whether I'll put a 3, 4 or 5 unit bay in the top. I'd like to combine unRAID and an HTPC server into the same box using some sort of virtual machine configuration. It it works I would probably have 1 or 2 DVD players in the top where I'll stream to HDMI or rip DVD's into my unRAID Movies folder. I also bought this multipurpose device: http://www.newegg.com/Product/Product.aspx?Item=N82E16820162022. It supports a bunch of flash memory types. It also has a hotswap 2.5" bay for laptop or SSD drive. Maybe I'll put my virtual machine on it. With the SNAP addon I wrote I can automate programs to fire when I insert flash memory. I'm doing that with my Olympus camera so far. When I plug it into an USB port on the unRAID machine it automatically mounts and copies the pictures to my unRAID pictures share. It's really starting to be fun. My daughter has her camera set to copy to a different location. When done with racks how much money do you think you'll have wrapped up in this build? I have a few friends pondering unRAID and something compact and low cost might be nice for them. Cooling might concern me though, will you be able to get much airflow through that? I see what you mean. I have attached some pictures. Since you have one can you take a picture with sata cable inserted to help show how far out they have to protrude before bending sideways as they would if the fan was there. The Icy Dock I just bought was $109 and it has a $10 mir which I'll send in for but never expect to recieve. And pick a motherboard probably in the range of $55 to $85 from the list I included a few postings back. I'd go with 2GB ram. For an AMD cpu I suggest the Sempron 140 at $33 or the Athlon II's. For an intel cpu I suggest that E3300. 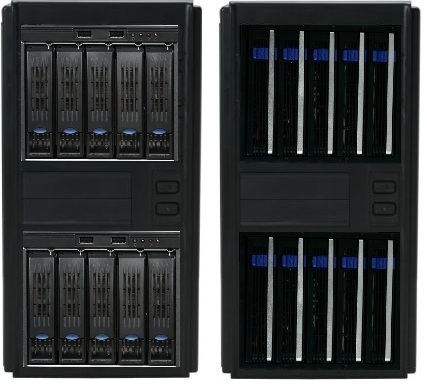 For psu there are a few 80+ models that range from $40 to $65 that will support 10 drives. There's the unRAID license cost and the flash drive itself. 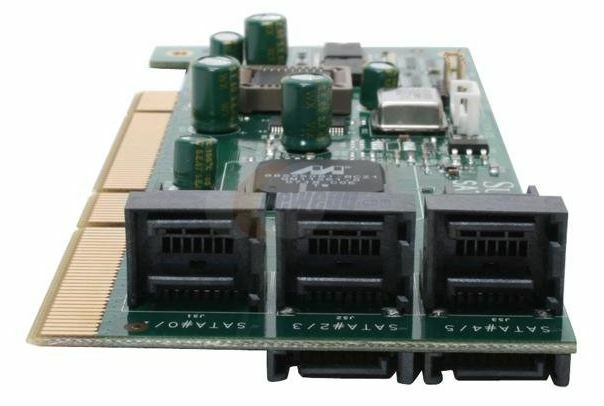 You need to use add-on sata cards to get it up to 10 sata ports. If you use a MB with 6 ports then add 2 cheap cards with 2 ports each then there is the ten. I personally use a couple of cheap add-on cards just to get some hotswap and esata ports. A pair of these would work. And then of course are the drives themselves. I'm starting to consider that using the Supermicro Flex ATX ATOM or ITX ATOM may be a good choice. The Flex ATX and ITX are smaller. Each has a PCIe slot, so the 4 port x4 Rosewill PCIe card could be used without any concern for cable placement. With the ITX board, you'll have plenty of clearance, 6 ports on the motherboard, 4 on PCIe. This provides an excellent low powered 10 port system. Could you post links to these?